Georgia Dunn Studio: 100 Illustrations and other exciting projects! In other news, I was contacted by 100 Illustrations to do a two page spread in their upcoming book! While I await the contract and some more details, I'm already looking forward to it. I received my sketchbook for The Sketchbook Project in the mail on Tuesday! Oh my goodness, to friends who were on the fence about participating in this project: I again encourage you to just do it! The sketchbook is only about 30 pages, and it's sized about 5x7--totally doable. I plan on working on it in the evenings after dinner. The paper really does encourage straight sketching, and so I may be taking up colored pencils briefly. The Art House Co-Op allow you to rebind the book with your own paper if you desire, but I'm happy for an excuse to play with pencils for a spell. I still plan to do my book as a time traveler's field guide, and to 'document' all the interesting people, items, and creatures he comes across in his journeys. I'm not certain what his name will be yet, though I've named his wife Marion. I'm toying with naming him after my good friend Destry. Expect sketches soon! In the meantime, Evan and I have completed a second design for threadless and it should be up for scoring in a few days. 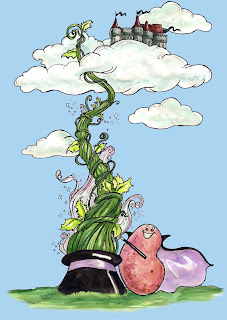 It's Evan's concept and my illustrating: "Magic Bean". How stinkin' cute is that? He really does have fantastic ideas for shirts! You can read about his previous tee shirt designs here. I also begun some Little Red Riding hood sketches I'll probably be sharing very soon. I can't get the wolf exactly as I want him to look--but hey, leave it to the Big Bad Wolf to be difficult, huh? Awwww, a vampire bean would be cute! We were trying to give him a magician look though ('Magic' bean, haha!). I wonder if Vampire Beans would grow vampires?